…changes in your habitat (environment, context, situation) create unprecedented forces and impulses. 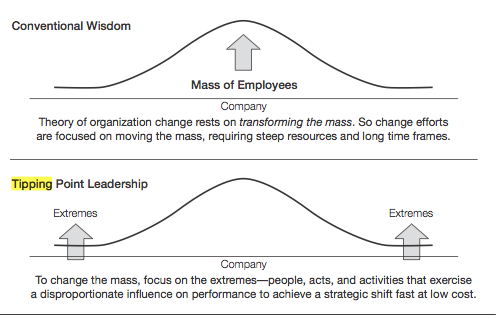 Execute a strategic shift in the organization as a whole. Precies het proces wat we vorige keer en deze keer hebben gedaan. Grote plaat gemaakt. Geordend. Geprioriteerd. Uit de productkolom drie zaken gepakt (atomize) en die verder uitgediept. Gaat nu worden opgepakt door de PLs. Op dat niveau herhalen we dit proces. Het leven is een broccoli. Focus on three factors of disproportionate influence in motivating employees—kingpins, fishbowl management, and atomization. Focus on another three disproportionate influence factors: leveraging angels, silencing devils, and getting a consigliere on their top management team to overcome political forces. Facts about "Tipping point leadership"
This page was last edited on 26 September 2014, at 14:42.